With the speedbump of airing its fourth and fifth episode out of order now a thing of the past, Supergirl returns to its building momentum, romantic angst, and still-learning-the-ropes leading lady for its sixth episode (while also calling on another DC Comics character to supply the action). Thankfully, the weaker moments will be completely forgotten when Kara Zor-El lets loose in a way her cousin Superman can only dream of. In "Red Faced", written by Michael Grassi and Rachel Shukert, Kara (Melissa Benoist) realizes that her hurt feelings over James (Mehcad Brooks) and Lucy's (Jenna Dewan Tatum) romance are tied to a larger anger she's refusing to accept. Luckily, a rogue military android shows up just in time for her to let off some steam. Any time a character from the world of DC Comics arrives to be adapted into live action, fans are eager to see how well the task is pulled off. The bad news is that Supergirl's version of Red Tornado is little more than a robot designed to give Kryptonians trouble (by using air blasts and cyclonic movement), not paying much attention to the actual source material. The good news is that it's no more or less nuanced than the weekly monsters with whom Kara has been forced to tackle. It's an issue that continues to seem in need of addressing, with The Flash, Arrow and even Agents of S.H.I.E.L.D. all realizing that season-long arcs, villains and serial storytelling is a safer direction. 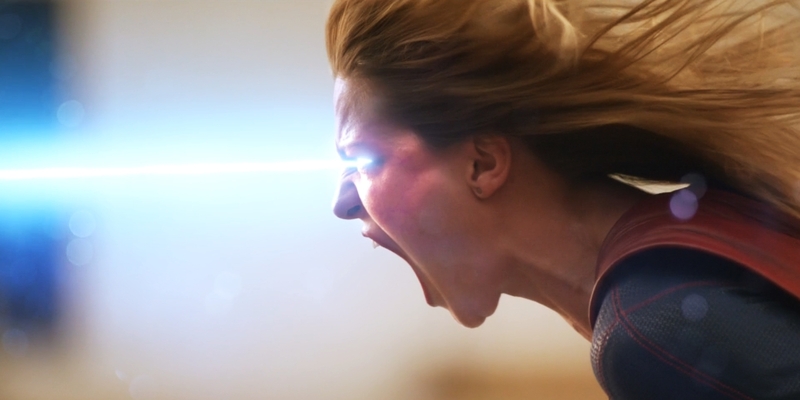 The Supergirl crew is entitled to learn that lesson for themselves, but it's impossible to not feel the pull of the larger plots or storylines completely drop when Kara enters combat with a one-note enemy. Thankfully, the writers concocted a twist on the usual alien-vs-robot formula, having Kara's sister Alex (Chyler Leigh) fight alongside her, doing battle with Dr. T.O. Morrow (Iddo Goldberg) as Kara entertains his mind-controlled android. It's refreshing to see Alex actually fighting the important battle, and in a show priding itself on female empowerment, a grown woman without superpowers taking on the villain - and winning - is more than welcome. It's another day at the office for Alex, but as she takes out the one-and-done villain, Kara is fighting the real fight elsewhere. We never had any problem with the show's feminist message, or its often tongue-in-cheek criticism of misogynistic or patriarchal biases and thinking. But the heavy-handed nature of said messages was a concern since the pilot episode, and the show has been hit or miss with its weekly affirmations or feminist examinations. This week gets more right than wrong, with the writing (and its execution) more concise than usual - and by the end of episode, touching something profound for a Superman character, or a superhero in general. The less said about General Sam Lane (Glenn Morshower) the better, but the eye-rolling moments of ignorance, bravado, and predictable 'military man' shtick show the role was perfectly cast. 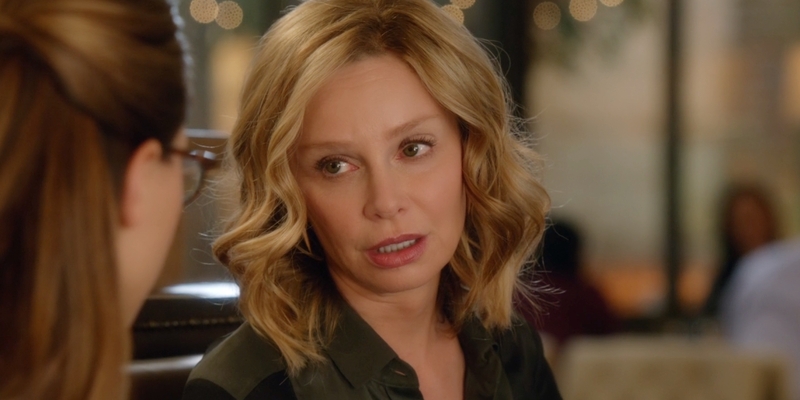 After Cat Grant (Calista Flockhart) previously explained how she can be a successful businesswoman and a mother(! ), she once again gives Kara - and the women watching - some eloquent counsel. What do you do when you have all the reason in the world to scream at the top of your lungs, or punch a brick wall, but doing so would result in blown eardrums and collapsing buildings? According to Cat Grant, the first step is realizing the problem is one more often faced by women than men since even Kryptonian girls are taught not to be too aggressive. But no viewer could have guessed just how much anger Kara had bottled up... a fact that Red Tornado learned the hard way. Supergirl hasn't offered a flawless episode yet (nearly impossible, considering how many masters it has to serve), but has made a habit of including a subplot, theme or moment showing what could be. It's no exception here, as fans once again see just how much story potential Supergirl offers that her squeaky clean cousin never could. The simple fact that Kara is mad - not hurt or upset, but mad - at having her life blown up a galaxy away makes her more relatable. On an even broader level, Kara's confession that "being myself doesn't make me feel more normal" and that her life "doesn't make sense" should speak to nearly every viewer. It's a backhanded compliment, but the insight from the writers and Benoist's execution are standout moments for the show thus far. And the same can be said for the payoff, delivered via heat vision. We'll be generous and say that being told to "look angry" on film is harder than it sounds, but Benoist's vein-bulging rage (and the work of the effects team) delivers an image that would earn accolades on the comic book page. The fact that it's informed by emotion only sweetens the deal. Pulling the music to a whisper, slowing the action to catch every shake, and watching a hero lose herself to anger isn't something we're used to seeing in any superhero movie, let alone a TV show. There was a time when a broad TV audience wouldn't go for anything less optimistic, reverent, or nostalgic than Smallville when it came to the blue tights and red cape. The fact that the above scene can show Supergirl embracing her rage and loss - in ways that Zack Snyder would most definitely approve of - is a strong sign of how far the genre has come - and more than enough to have us tuning in next week.